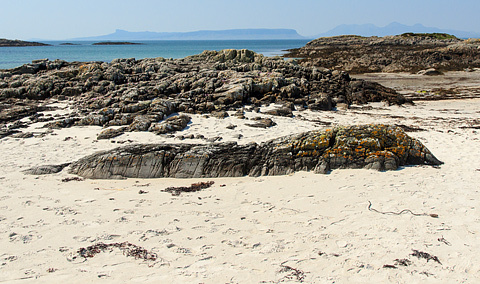 A scene near the end of Breaking the Waves was filmed at Traigh, one of the many silver sandy beaches that stretch along the coast of Morar.. There is a car park almost on top of the filming location which is closeby the B8008 which is now a far more pleasant road to use since it has been superceded by the new road to Mallaig. It is less than 50m from the car park to the large distinctive rock which looks like a beached whale or sea monster sunk into the sand.